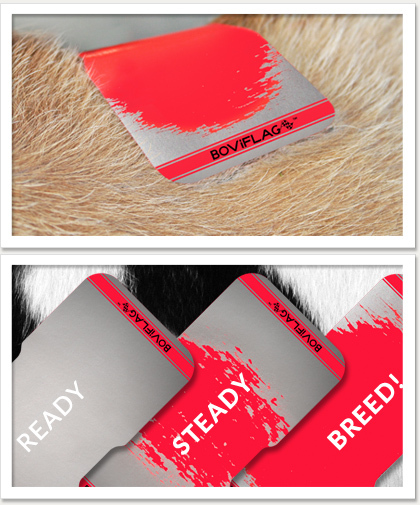 The BOViFLAG™ heat detection aid helps to identify estrus in cows. 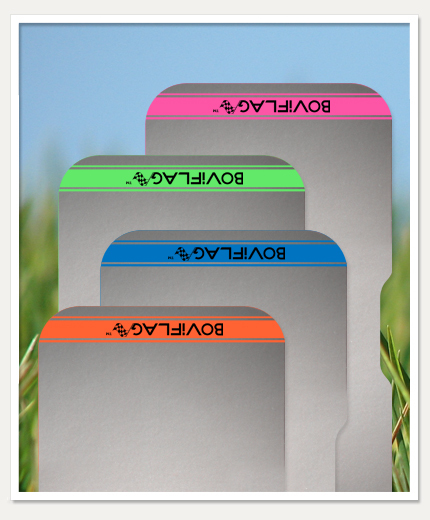 The product features a scratch-off surface on top of a brightly coloured self-adhesive layer. The patch is stuck between the hip and tail head of the cow. When the cow is mounted by other cows, the scratch-off layer is removed, exposing the brightly coloured layer underneath. When sticking a patch between the hip and tail end of a cow, you effectively deal with two concave areas perpendicular to each other. We have shaped our patch so that it is narrower in the middle. This prevents edges from lifting up when the patch is curved around the spinal area of the cow. We don’t want the patch to come off too easily, so we designed it for better fit. The heat detection patch should be attached between the hip and tail head of the cow, at a 90 degree angle (perpendicular) to the spine. Take a cloth or brush and rapidly wipe the most dirt and moisture from the position where the patch will be applied. This will help to prevent patches from detaching. Long haired animals might require better site preparation. Combing out loose hair will also assist adhesion of the detection aids. Glue works better at room temperature. When working in extreme cold conditions, you can achieve better adhesion by warming the patches slightly before applying them. This can be done by placing the patches in hot water of about 60 degrees Celsius (140o Fahrenheit). Simply remove the pull-off layer at the bottom of the patch, and place the patch on the position of application. Press firmly on the patch so that the glue can penetrate the hair and attach to the skin of the cow, if possible. Take care not to damage the scratch-off layer during application. BoviTime BoviFlags heat detection patches works like scratch-off cards. Cows mounting the cow in oestrus, will rub off the silver scratch-off layer. After repetitive mountings, most of the silver scratch-off layer will be removed. This will be a clear sign that the cow is in oestrus and have been mounted several times. If the silver scratch-off strip is only partially removed, it is probably caused by playful behaviour of the cows, tail swipes or other cows resting their heads on the heat detection patch. At least 50% of the silver paint should be removed to indicate standing heat. High stress environments, hot weather and crowded conditions could cause less mounting behaviour. This product is guaranteed free of defects in material and workmanship for one year from the date of manufacture. Suitability of the product for the Buyer’s intended purposes is the responsibility of the Buyer. Liability is limited to the replacement or replacement value of the product.